Fly in and taxi up to one of these charming cottages and spend a night or two at what is one of the nicest grass airstrips you’ll ever find. These cottages were originally part of a Family camp at Lake Morey, Vermont, and are now tucked into the woods along the runway, within walking distance of Lake Fairlee and a short drive from Dartmouth College in Hanover, New Hampshire. Each cottage has a bedroom with 2 single beds or a queen, a sitting area, a bathroom with shower and hot & cold running water. Towels, soap, bed linens, pillows and blankets are all provided. There’s assorted interesting reading material in each cottage but no TV, radio or phone. Cottage # 2 has a separate living room with a pull out sofa that can accommodate another 2 people. We also have a fold-up Rollaway bed for $10. All cottages also has a screened front sitting porch, perfect for enjoying sunsets and airport activity. The cottages, set back into the woods beside the runway, stay about ten degrees cooler than elsewhere on the property. 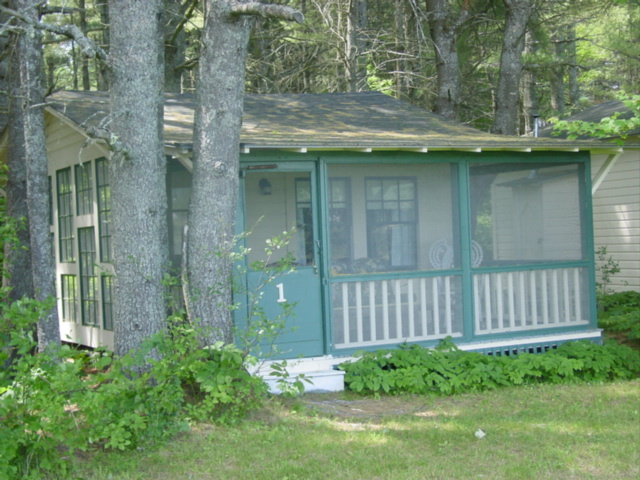 These cottages are available to rent from mid-May through mid-October by e-mailing us or, better yet, phoning 802-333-9254, day or night. Payment is in the form of check or cash. We don’t do credit cards. Brian is an accomplished hot-air balloon pilot with over 6000 flights and has flown from many parts of the world. Contact him to arrange a wonderful flight in the Connecticut River Valley. Would there be a cabin available for 3 nights sometime between 6/29-7/5? I am related to the Palmers who live in the Brick house at the intersection just up the road from the airport. Hi Brian….we are tossing dates around but want to check any cabin availability for early Aug….two adults and maybe a nine year old?